Learn how to route leads to your team members. 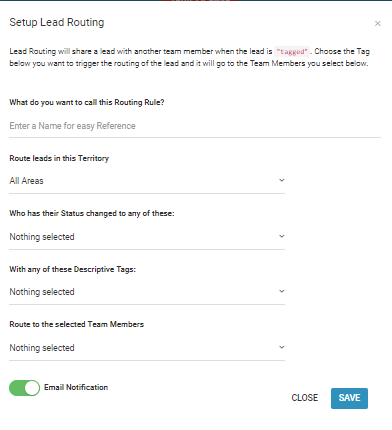 The lead routing feature allows users to automatically rout leads or people under a certain tag to team members. New leads can be routed to another team member as they are generated. Setting up the routing rule is necessary in order to inform us of who will have access to the new leads. Note: The owner or main account holder will always have access to every lead. Before the routing rules can be applied, teams must be properly set up. Once you have your team set up you will need to add team members and decide what access you would like to allow them to have. Click your name in the right hand corner. Locate and click on 'Account Settings' from the drop down menu. Locate the 'Advanced' module at the bottom left of the screen. Important: You will need to select at least one tag or the routing will not be created. Select the territory or sub-territory. People within this territory that have been tagged will be routed. Select the status type you want to have routed. You can select multiple statuses. Select the tags you would like to have routed. You can select as many tags as you would like. Select the team members or team member you would like the rule to be routed to. Once all of the selections you would like to make have been filled in, click on 'Save'. Search Terms: Routing, routes, route, leads, lead, teams, team, members, member.